There is a section at the back of the book where some of the "techy" stuff that you might use when playing some of the games is used. I thought this was great as for a family who doesn't have a self-proclaimed Geek for a Mother (or an incredibly-intelligent-computer-fixing-website-building-film-editing-photo-editing-blue-screen-using Father) it will give some simple and helpful advice on how they too can create some of the fun as seen in the book. 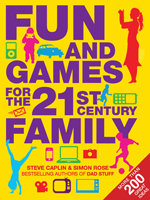 Fun and Games for the 21st Century Family has an RRP of £9.99 but it is on Amazon at the moment for £6.19. It is written by Steve Caplin and Simon Rose and has over 200 ideas, but will inspire you to create more games of your own and will provide hours and hours of fun for years to come.